Our world is one, ultimately, of diametrically opposed forces in balance with one another. And you may say, 'Does this not mean perpetual conflict?' And I would reply, 'It means perpetual peace.' To diminish one's opposite diminishes one's self. On the Guildpact, 3209 Z.C. In one instant Agrus Kos finds himself transformed from a Azorius spectral guard without any free will into a living being. Not a zombied body but one that is truly alive. Who had done it and how? Something this powerful surely comes at a cost. Wait... this body doesn't seem right. It's too young, and is pretty out of shape for the age it's supposed to be, nothing like Kos was at this age. He's possessing someone. A voice from inside his head speaks out, the voice of the body's owner, confirms it. A second voice from outside the body calls his name. Oh that's right, he's not at this post anymore. He's actually inside the Senate chambers and it's Feather that's addressing him. The body tells him his name is Obez Murzeddi and Kos better not get too comfortable because he's going to want his body back when this is over. Obez Murzeddi is a lawmage, accomplished ectomancer, and a trusted staff member of the Grand Arbiter. Augustin has transformed Kos into an avatar of Azorius. If he accomplishes his mission, his duty as a spectral guard will be considered served, and he'll be free to move on. His mission: Kill Szadek . But first, some explanation. How can Szadek be free? Agrus Kos had him arrested twelve years ago. While that may be true, it was an outcome that was orchestrated by Szadek himself. "The Dimir exist to oppose the Guildpact, to strengthen its power by the force of that opposition. It is why House Dimir was welcomed into the accord. Rakdos and his foul ilk, too. The Guildpact could not have lasted as long, or been as powerful, without that equal and opposing malevolence. But you arrested Szadek for crimes against the Guildpact. You created a paradox in that his actions were the very essence of his purpose within the Guildpact." Naturally Kos comes to the conclusion that it doesn't make sense. Unfortunately he also decides after more explanation from Augustin that that's something he just has to accept. It's the nature of paradoxes to not make sense. There's still hope though. Kos was the key to Szadek's plan and he's now the key to Augustin's. 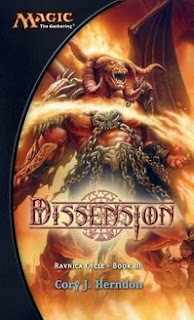 "Szadek had to drop his defense to let you succeed and used his lurker servants to convince you he was beaten. For that trick to work, however, he had to truly allow you to be a danger to him." 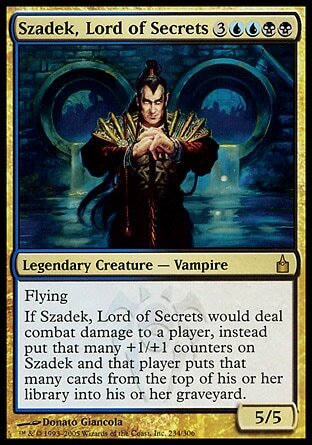 Szadek's power is based on secrecy and deception, but once Kos was allowed past his defenses, he could no longer be pushed back out. Kos is the only one that can harm him. 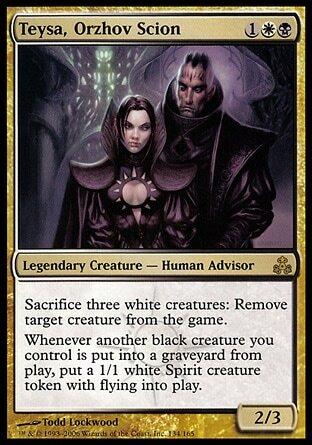 Wait... what about the lurker, he hurt Szadek to right? The Grand Arbiter comes up with some theories that don't sound very convincing, but he says that in the end it doesn't matter because the creature is dead. It must be. They've hunted every aspect of it for the past ten years. Saint Kel adds the song of the Guildpact can still be heard. It's weak, but it's still there, and if he kills Szadek the Guildpact may yet heal itself. So Kos has a job to perform, in the body of lawmage Murzeddi, and any other bodies that become useful along the way. As the avatar of Azorius he's anchored to the lawmage but he can temporarily jump to other bodies. And Muzeddi isn't just a body. Muzeddi himself shares his mind and is there to provide his experience, council, and abilities as an ectomancer. Feather volunteers to assist Kos once again for one last mission. 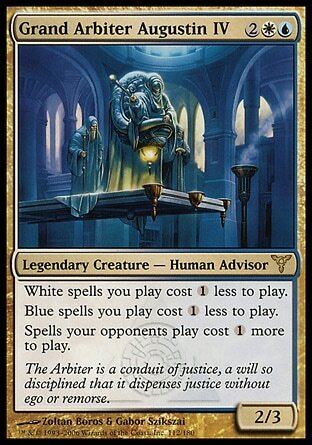 Though she is by default the new Boros guildmaster, the commander-general can continue to be acting guildmaster for a bit longer while she helps to solve a problem she helped to create. With the situation understood and commitments made. The question is now to find the vampire. He's in the city of ghosts right? No. There's been a witness. Szadek doesn't seem to be trapped on the other side anymore. Evern Capobar is brought in by the bailiff, and he gives them the bad news that Szadek isn't working alone. 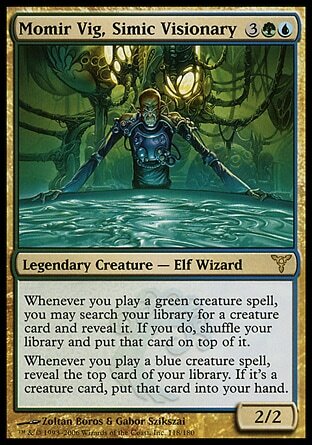 He tells them what he saw and they conclude that Momir Vig has thrown in with Szadek is because he'd enjoy being freed of the Guildpact. The magical restrictions on how, who, and what he can experiment on will be gone and he'll be free to run experiments as horrific as he can imagine. News of what looks like Savra being referred to as the zombie-god is also distressing. Crix has finally dug her way to Pivlic, and he's quite surprised he's been able to survive long enough. The column that fell on him has seriously crushed him. He's seen someone crushed before and they seemed perfectly fine up until the moment that the run away wagon was pulled from him and he near instantly died. This might be one of those situations and Pivlic tells Crix there really isn't much hope for him. If they move the column he'll die too quickly for teardrops to be of any use. She's much faster than she looks. The goblin uncaps all the drops with her and when the ogres lift on her signal, she administers them two at a time in rapid succession. The pain is like nothing he has ever felt, but it works. With the whole Imp Wing collapsed, the quickest way of there was up, and so Crix picks up the imp and flies them out of there. The view from above is more painful than the healing. Pivlic has been proud of the Imp Wing and his accomplishments there. Not to mention important documents are all kinds of money were now buried under the rubble. And now it's gone. The whole Utvara isn't looking too great. Crix fills him in on what's happened, and the nephilim themselves can been seen leaving the valley and heading towards the city. He was in charge for a few days and the whole of Utvara falls apart. He needs to at least tell Teysa. She needs to know her fortune has been destroyed. Free to consider more than just survive, Pivlic notices that the goblin seems pretty dejected. When she tells him about Niv-Mizzet and his abandoning of her, he tells Crxi to not think of it as the dragon leaving her, but as the dragon leaving her in charge. Who can say he didn't? They stop and have a bite to eat, and discuss what to do next. Teysa has to be warned. She's his baroness, and he has to tell her what's happened and that she's in danger. It'll at least be better for him if he warns her rather than her hearing the news form someone else. As for Crix, the ogres have been searching for a chief in this time of crisis, and after they saw her rocket legs they decided to follow her lead. She's going to stay behind and do what she can for the survivors, and do so with a lighter heart thanks to the imp's pep talk. She's badly wounded but still alive. Wenslauv pulls our her teardrops, but Razia forebade the use of them. The angel demands a report, and Wenslauv says all the angels are dead and there are no signs of hostiles but the Parhelion is about to crash and she needs instructions on how to fly the thing. The so-called Razia asks for a hand, and Wenslauv... helps her up and isn't devoured by worms? Razia then also gives Wenslauv the appropriate access codes. The problem is that they have only about three minutes left before the crash and the controls were designed for a pilot with the strength of an angel. It's no use, and the Parhelion crashes into Prahv with enough force that the boom even stops the the nephilim in their tracks. For a second there I thought Kos was just going to be completely 100% alive. That would have felt like a pretty disgusting trick. Herndon may as well have just gotten straight to it with Kos' first appearance if that was the case, but thankfully it didn't happen that way. Instead we get the much better outcome of Kos becoming an avatar with the ability to possess other bodies. Kos is back with Feather at his side and he has a voice that only he can hear making all kinds of remarks. The only differences are that Kos is the one that's dead (with possession powers) rather than Borca, Feather is now guildmaster rather a fallen angel, and the third wheel (Obez) is less annoying and looks like he'll actually be useful. Positive changes all around. Let's just say my initial reaction is to dislike paradoxes. Did Szadek really know Kos was going to arrest him? How did he know Kos was going to be there in time? Did he know they were going to chase after the kidnapped Fonn on an injurred zepplid with an angel towing it? Thinking about it a little more, it's possible that the Convocation song was a lengthy one, and he had all the time to wait for the rescue before killing Savra and allowing himself to be defeated. But didn't he command Lupul to kill the intruders? Did he know that Jarad was going to bug control the shapeshifter to save Kos and give him the opportunity to make the arrest? Or was the whole thing just a backup, and it would have been better if he had destroyed the Guildpact the other way straight out which would not require him to create a weakness in his defenses and allow the possibility to be stopped? Oh paradoxes. I am perfectly fine with the teleporting castle used to search for the ends of the universe. Pardoxes make my mind go in all kinds of crazy circles. Look at that, Razia wasn't dead. Why not? Didn't Szadek know he hadn't killed her? He was able to control the other killed angels and wait for the return of Feather to use them against her, jadn't he realized that Razia was still alive? But now Wenslauv has failed, and Razia wasn't Lupul. Why was Lupul even on board then? Why show him to us? To let us know that he was the one that killed the angels? The Parhelion was clearly aimed and Prahv, perhaps he's the one that set the trajectory. Perhaps he had kept hidden and learned the command codes and set the controls after he slaughtered them all. 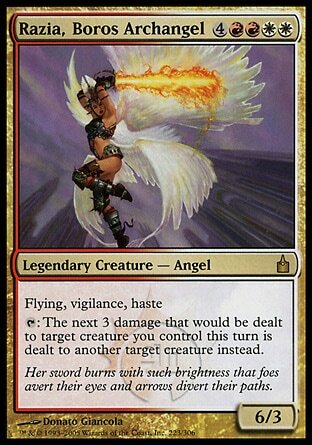 One last question is now that Razia is back in Ravnica, will her angel immortality kick back in, or is she finally, truly dead?